When it comes to fixing pier and beam foundation damage, contractors in cities such as Fort Worth, Dallas, Grand Prairie, Mansfield and beyond commonly install foundation piers. Professionals use exterior piers to support the structure’s perimeter beam. Interior piers are utilized to secure the wooden girder beams that carry the floor joists. To find out if piers are needed to support your beams and prevent deterioration, consult with a foundation repair contractor. They utilize them when repairing Fort Worth, Dallas, Grand Prairie and Mansfield properties because they’re effective in terminating foundation issues. They do this by keeping a structure from moving, and ensuring that it is also upright and level. It’s important to read all about foundation damage in pier and beams. These types of foundations are quite different from concrete slabs. Due to the 18”-36” tall crawlspace that is typically located beneath them, pier and beam foundations are prone to water damage. That’s a result of heavy rains or the lack of a proper foundation drainage system. It’s imperative to keep your foundation elevated. With over 52” of rain falling in the metroplex from January to November, 2015, that’s a real concern. If you live in the Fort Worth, Mansfield or Grand Prairie area, you’ve probably witnessed this. So contact a contractor about fixing pier and beam foundation damage right away. Another reason why foundation piers are used for repairs on pier and beam houses is because they are relatively inexpensive to install if they’re made of concrete. These types of supports are are much less costly to install when compared to steel pilings, helical piers or other types of structural supports. A contractor may only need to use 4-5 concrete piers when fixing a damaged foundation. Or, if the pier and beam foundation is seriously injured, 15 or more may be required. Much depends upon the size of the home and how much destruction has occurred. Of course, the contractor may find that shims are the best solution. An expert will know what should be done when fixing pier and beam foundation damage using foundation piers. Make sure you hire a highly experienced professional. Why Repair Foundation Damage On Pier And Beam Houses? 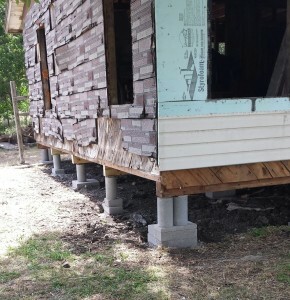 Because by restoring your house using foundation piers, sagging floors and a variety of issues can be prevented. Harmful problems caused by differential movement in the foundation can also be terminated. Remember: Reactive soils in the DFW area can harm a foundation over time. That’s why it pays to take precautions if you notice cracks or other forms of destruction. If you require pier and beam foundation repair, a contractor can probably fix it in 2-3 days. Of course, it may not need to even be serviced at all. So don’t delay in contacting someone about fixing pier and beam foundation damage if you see some. It’s wise to take the time to carefully inspect your foundation. In 30 minutes of less, you can find out a lot. In addition, you may want to review information about six common problems with pier and beam foundations and how to avoid damage. If you’d like to take preventive measures to protect your valuable property, contact HD Foundations for a no-charge estimate.